I stumbled upon “Spill” sculptures by Subodh Gupta online and it reminded me of the giant pet cone created for MTAC’s 2015 Art Festival event. Gupta creates new meaning from ready made objects with the objective of inciting dialog around social issues. His “Spill” sculptures are about the wasting of natural resources and the emptiness of consumerism. MTAC’s oversized pet cone was created to suggest the scale of the animal issues that we focus on, mainly pet adoption, which the cone has come to represent. And much like how Gupta uses everyday kitchen objects to speak of social ills, MTAC uses the humble pet cone to speak of the plight of animals. I was thrilled to find and learn about Gupta’s inspirational artwork. He too challenges viewers to think of our shared impact on the world by helping us see everyday objects in a completely new way. 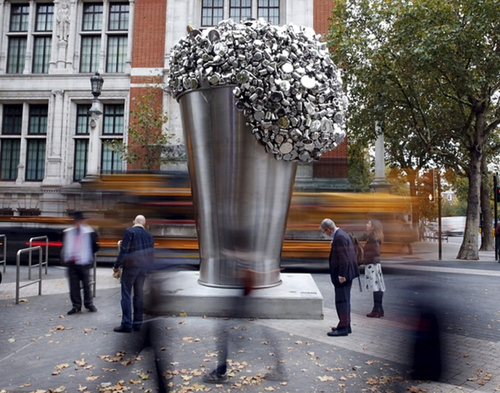 Check out more of Subodh Gupta's work here.